Driven by her belief that everyone has a moral obligation to do the best they can, Elizabeth Franz Albert has dedicated her life to being a beneficial member of her community. She has spent the majority of her career as a conservationist and environmentalist, striving for a cleaner and healthier world. In her pursuit of a healthy environment, Ms. Albert campaigned against the herbicide Dacthal, which causes lymphoma and Parkinson’s disease and is used by lawn care companies, home owners, farmers, and golf course greens keepers. She is also an organic gardener, growing produce without harmful pesticides. Another key part of her professional journey was art. She discovered her talent as a painter early on, and participated in several exhibitions. Her specialty was portraits and still life. Her crowning achievement was having her art praised by the architect William McCoy, who designed the Pickwick Theatre in Park Ridge, IL. Ms. Albert’s career progressed again when father offered her his seat on the stock exchange, trusting her to invest wisely. She proceeded to thrive as an investor in stocks and real estate. Although Ms. Albert was widely successful in every task she undertook, her path was not without its challenges. She initially wanted to be a prima ballerina or a doctor, but, thwarted by disease, she was unable to fully pursue those goals. She did manage to contribute to health care, however, and accumulated such a vast knowledge of medicine that she was able to contribute to biology textbooks and save lives. 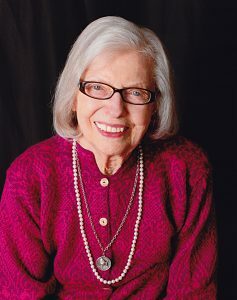 Another early interest was architecture; although her illness did prevent her from taking the field further, Ms. Albert did design a house during her college years at Chevy Chase Junior College in the early 1940s. The fact that she was able to find a way around every obstacle her sickness threw at her shows an extreme amount of perseverance and determination. In keeping abreast of the developments in her fields of conservation and the arts, Ms. Albert is a member of the American Farmland Trust, the National Trust for Historical Preservation, the Cousteau Society, and the Natural Resources Defense Council. She also maintains affiliation with the Environmental Defense Fund, the National Museum of Women in the Arts, the Chicago Symphony Orchestra Society, and the Art Institute of Chicago. Ms. Albert is a former member of the Landmarks Preservation Council of Chicago. With her dedication to helping people in need, she has been involved in a variety of organizations that have brought immigrants from around the world to the United States. As a testament to her hard work and dedication, Ms. Albert was a featured member in numerous editions of Who’s Who in Finance and Business, Who’s Who in America, Who’s Who in the World, and Who’s Who of American Women. Ms. Albert spends her spare time enjoying music, antiquing, gardening, and reading. She also breeds champion poodles, pursues her interest in architecture, and renovates houses.